Here is how to read my edition and translation: R and B refer to the Riesencodex and the Berlin MS, respectively. The words are listed and numbered in the order in which they appear in the Riesencodex. 1 have written out the Latin abbreviations and the superscripted “o” and “v” over some of the German words in both texts. 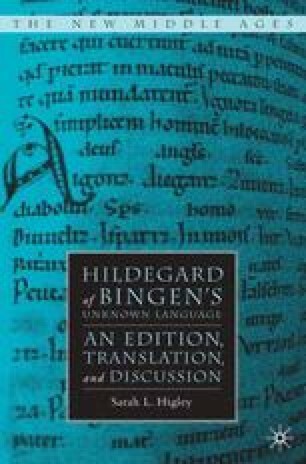 Since 1 privilege the Riesencodex, and it gives Latin translations two thirds of the time, 1 put all Latin glosses of Hildegard’s invented words first and indicate their presence in “R” and/or “B.” While B’s glosses are often helpful, 1 prefer to depend on those by R. All German glosses, if they occur for a word in B or R, are put afterward in parantheses, similarly indicated. B adds a German gloss above R’s Latin gloss for a little over half the text, but when B infrequently adds a Latin gloss that is missing in R, 1 put the B gloss first to maintain my Latin-first rule. Very infrequently, R will give both a Latin and a German gloss, in which case 1 indicate both with an “R.” In some instances it is difificult to tell what is authentically Latin or German.